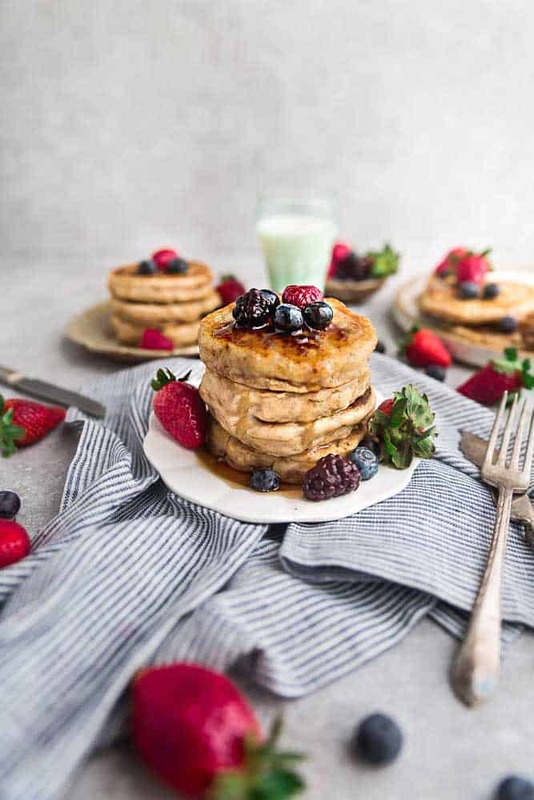 Eggless Pancakes from scratch are perfect for a vegan breakfast or brunch. Best of all, this recipe produces the best light and fluffy texture every time. Weekend breakfasts are a favorite around here. 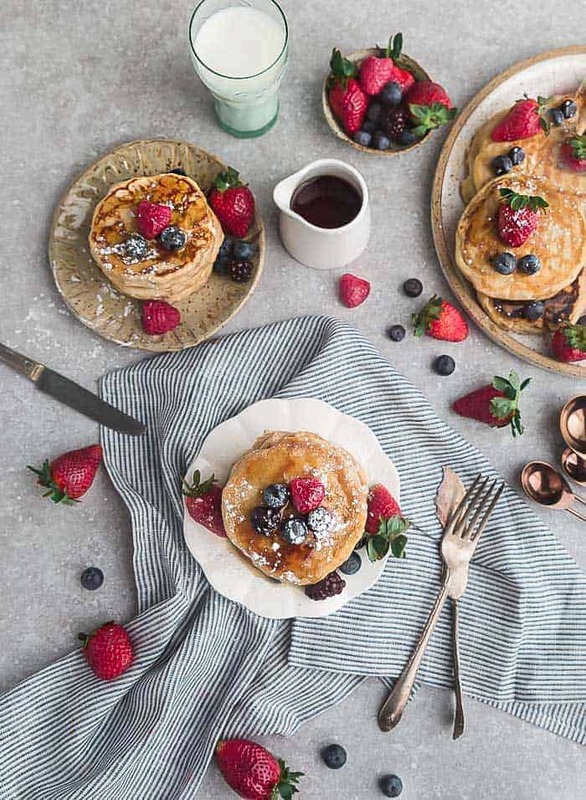 As much as my family loves french toast bakes –> Blueberry, Strawberry, Mixed Berry French Toast – nothing beats a full stack of fluffy pancakes on a lazy Sunday. These Eggless Pancakes are one of our go-to pancake recipes. They are dairy free, refined sugar free and turn out light and fluffy. This recipe is perfect if you are vegan or for those times you run out of eggs. 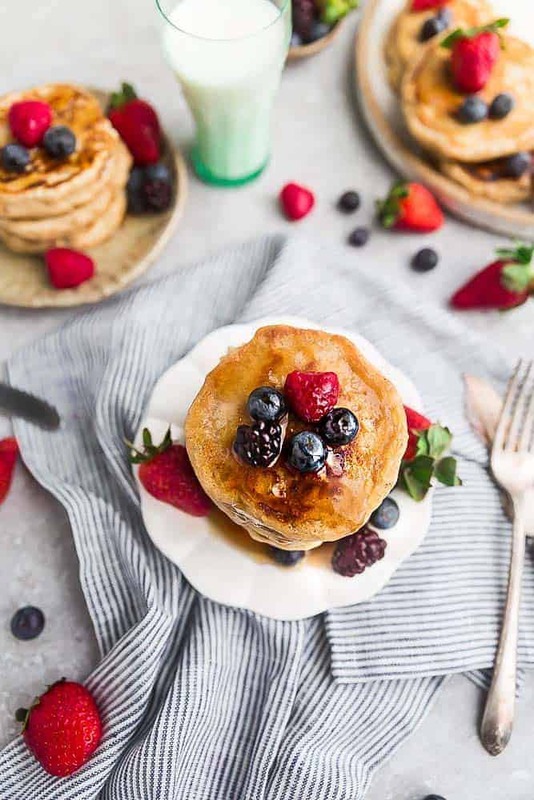 And if you are looking for a gluten free flourless pancake recipe, these Coconut Flour pancakes are another reader favorite. HOW DO YOU MAKE THE PERFECT EGGLESS PANCAKES? Start off by whisking all the dry ingredients into a bowl. They have the usual flour, coconut sugar (or granulated), cinnamon and salt. Next you measure out some almond milk (or any milk you prefer) with melted coconut oil, vanilla and melted vegan butter. Stir the wet ingredients into the dry ingredients until just combined. If the batter is too thick, add a little bit of milk as you go for thick, fluffy pancakes. If you prefer them on the thinner side, feel free to add more liquid. Heat your griddle or a frying pan and grease with butter or some cooking spray. Using a 1/3 cup measuring cup, pour batter on the griddle. When bubbles start to form on the sides and the front, flip to the other side. Cook for another minute or until brown. Serve with maple syrup or some fresh fruits. Wrap any extra pancakes and store in freezer for up to 2 months. CAN THE RECIPE FOR THESE EGGLESS PANCAKES BE SCALED DOWN? Absolutely. If you don’t need a big batch, you can definitely scale this recipe down in half. Since I meal prep once a week for certain staples, I usually like to make a bigger batch. I figure since I’m going through the trouble of making and flipping all these pancakes, I might as well make more and freeze the rest. That way, you can just pull one or two out when you need and heat them up for breakfast throughout the week. 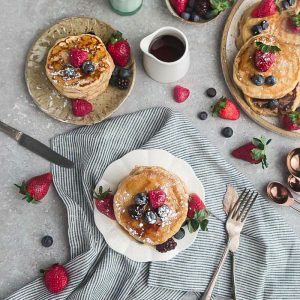 Eggless Pancakes from scratch are perfect for a vegan breakfast or brunch. Best of all, these cook up light and fluffy. 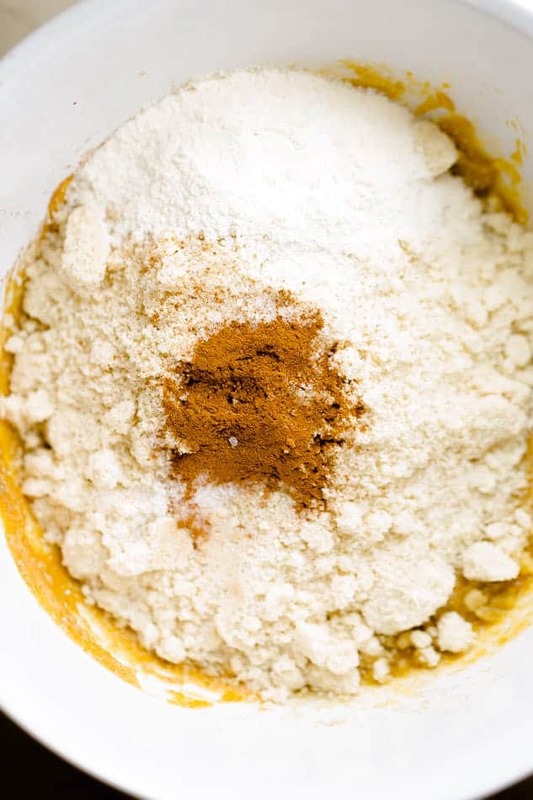 In a large mixing bowl, whisk together the flour, sugar, cinnamon, baking powder and salt. Measure 1 2/3 cups of milk in a liquid measuring cup. Whisk in the oil, vanilla and melted butter. Stir in the wet ingredients to the dry ingredients. Do not over-mix. Lumps are perfectly fine. Add more milk or water as needed to thin out pancake batter to preferred thickness. Set aside for 1-2 minutes for the baking powder to activate. Heat a griddle or frying pan at medium heat and grease with vegan butter or cooking spray. When the pan is hot enough, measure out and pour 1/3 cup of batter for each pancake. Once you see bubbles appear on the sides and a few on the front of the pancake, flip with a spatula. Cook for another minute or until golden brown. Transfer to a plate and repeat until all the batter is used up. Serve with maple syrup and fresh berries, if desired. Was looking for a good eggless pancake recipe to make for my mom since she is allergic so thank you. Going to try making these for her tomorrow. Thank you for sharing this recipe. My young grandson was diagnosed with egg allergy and he loves his pancakes and waffles. I tried this recipe last weekend and sent the remaining pancakes home with him and they are gone! He loved them! Thank you, again. This is a keeper recipe.